This prep section is a collection of photos showing how our projects go together. The fate of a project is determined before any tile is set! This is a photo of the first day of prep. Here, Jason is setting the curbs and we have Kerdi fabric hung on the walls. He will also set the drain height. Click here to discover why a great tile guy is king! Discover our proven self leveling technique! If you want big tile you may have to self level. Find out how and why. Pro Fireplace Remodel in Milton, Ga.
We would love to collaborate with you on your next tile project. When we are working on a tile job we imagine that a master tile man is going to come in after us with a fine tooth comb. It keeps us running at peak performance! Be sure to check out our YouTube Channel for more in depth building videos. Ask your potential tile installer, "Will you be on site to supervise the granite or stone delivery/installation?" We will be to ensure a high standard finish! Ten details added up make for a smooth bathroom remodel experience and we have them covered. 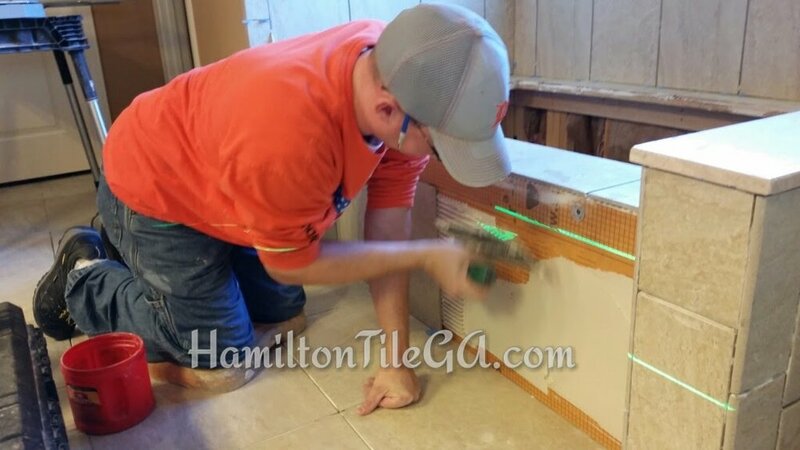 Click here to read my popular blog post called "Options for finishing your shower curb"
In the tile industry every installer has their own method and preference that they swear by. Here we have appreciation and respect for the STANDARDIZATION of Schluter Systems and the ANALYSIS behind the TCNA Installation manual. It's not about our preference .You're not just taking our word for it, you'll be confident in an aggregate of installation engineering, research and development. A short video of our master bathroom prep. Is your builder using the most modern building techniques? 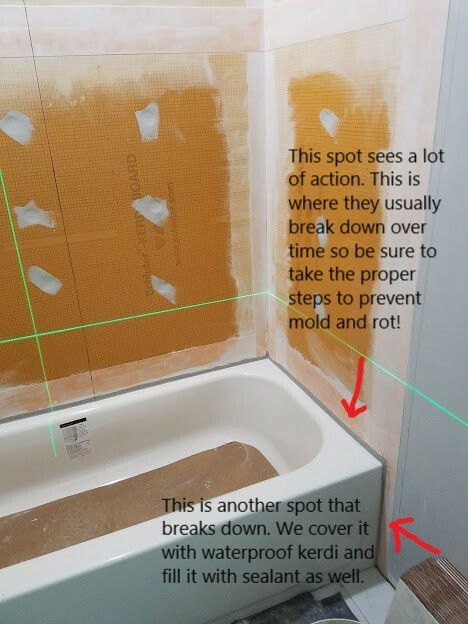 Are you positive you are purchasing this level of preparation on your next master bathroom remodel? Getting great thin set coverage is a huge part of a great tile install. It ensures you won’t have cracked grout or broken tile after 10 years of use. Setting a tile floor is more than just plopping down a tile on thin set. You have to WORK to get this kind of coverage! Can you trust the competition to guarantee this? Jason working away at the initial phase of a Schluter line drain installation. It's very uncommon to see a website with photos and videos of the building process. I do this because I want you to know how we put things together. I want this gallery to build confidence in you. Your project will be done above industry standard and consistency is our greatest strength. This is a custom shower pan and it's the foundation of a shower. We are well versed in this technique. We install waterproofing membrane into a bed of thinset after all this cures. Hamilton Tile Pan packing prep. A video on our pan packing process and what our general prep looks like. This is a long form video. A water proofed Kerdi shower ready for tile. With this system water stays on top of our fabric and is directed to the drain. It is a ‘moisture management system’ This shower is vapor proof. Watch this short video for an explanation of how a traditional shower system works compared to a Schluter shower. A prepped shower fit for a king with a linear drain. This moisture management system will ensure a long term shower installation and isn't that why you ultimately chose tile, So you NEVER have to mess with it again? We always tell folks that we are the least expensive price because due to our care and knowledge you will only have to pay to have your project done once. In our principled view point of construction, a project takes as long as it takes to do it correctly, with quality. Sure, we could make a few extra bucks by cutting corners...but that's not who we are. I can't guarantee you the competition holds the same ideals...the same standards. When our projects are done you can tell the difference. If you're having a shower built, having it waterproof is the most important part. This is how we waterproof. Schlutersystems.com speaks for itself as to why they have the best products for a bathroom. Ask our competition, "How do you water proof?" That is the most important question when you're getting a bid for a shower. Make sure the competition is doing a ‘flood test’ on their work. It’s not economically expedient for a tile company because it involves a drive to your house, and a bucket of water to fill the pan…and nothing else can be done on the shower for 24 hours! Better safe than sorry though, I always say. After packing the pan and water proofing, we install the shower floor tile of your choice. Once it's dried we cover it and start the wall tile. An example of a tileable drain by Schluter Systems. You have a number of options for your drain finish. Oil rub Bronze, Brushed Nickel, or Stainless. As well a plethora of line drains. Check out the drains here. 'Back buttering' is a pretty important step in the process which most installers skip. You put a thin layer of thin set on the back of the tile before you put it on the troweled section of the wall in order to ensure 100% coverage. This helps prevent 'hollow spots', cracked grout or in the worst cases, broken tile. Another aspect to a proper install is "burning in" your thin set. You take the flat side of your trowel and force the thin set onto your substrate. It allows for the thin set to make a connection at the molecular level. After this you apply the thin set with the gauged side of the trowel. "Burning it in" differentiates the pros from the amateurs. Another Ditra Heat system going in... Warm up your toes every morning and simultaneously increase the comfort and enjoyment of your bathroom routine! Another heated floor system. Ditra heat with a properly prepped shower in the background. If you care about how your shower is put together or the steps involved in completing your project...You're the customer for us! Noticed looking around there weren't any pictures of myself on this site. Hello, I'm Ben...and yes, I am a skilled tile guy and the curator of this web page. We've divorced cement board and sheetrock. Kerdi board is a far superior product to sheetrock. We put up Kerdi board which is water proof and dust free. A DEFINITE upgrade if you use Hamilton tile for your back splash remodel. The most important part of a tile project is what happens BEFORE tile is set. I visit other tile sites and they never show this stuff. We turn out high standard work because we are sticklers about our waterproofing and many details the other guys ignore (or simply don't know). If you're interested in a 'full service' tile job, You've found your new tile guys. A custom backsplash install. We recessed that 100lb pound of granite into the wall behind the stove. The homeowner called it her "mountain"
Communication is so important in a remodeling project. You have a vision of what you want and we advise you according to our experience and knowledge. We then come in and produce center-piece worthy projects that are set in stone, like this fireplace. This is what happens to your house when someone builds your shower incorrectly. Ben gives that "TWO THUMBS DOWN!" Many builders still use wood for their curb, which is a food source for mold and bacteria if not water proofed correctly. Yes, we use Schluter and still pack 100% shower pans. Just because we use a proprietary method, that doesn’t mean we have to use their foam pans. There’s levels to this and we are top! Ditra takes the place of cement board on flooring jobs in our world. We use ditra when we're putting tile on plywood. Cement board for this application is antiquated. Here’s one of our DIY videos located at our YouTube channel. It’s a video of one of our intricate steam showers going together. We create content here at Hamilton Tile so you can verify with your own two eyes what you’re getting. Finished pictures are great, but show me the work! Ditra by Schluter Systems taking the place of cement board as our uncoupling layer. This plastic product is set into a bed of latex thin set. The waffles act as tiny pillars holding up your tile. Ask your installer, "What is the purpose of this layer?" This is an example of how we build our corner benches. Notice there is no front to this bench. That's because we build it with 2" structural Kerdi foam. When we tear out a traditionally built shower a lot of time the water leaks around the benches. Not when you hire us because when we install our benches there are no penetrations through the waterproofing. Here’s Jason installing a custom corner seat. Your best option is a hard surface top. Notice this inset box. 100% waterproof with a kerdi fabric flange. From what we see in the industry, very few people are building waterproof soap niches. We build ours custom to your specificiations. My friend in NH built most of this shower himself. More power to him. He was smart enough to know that he didn't know, so while on vacation I packed a custom pan, water proofed, set the shower floor...Heck, I finished it. PEOPLE! Building a shower is not a DIY project. Moral of the story. This is an example of a Rondec Schluter profile edge. I like these because they eliminate the need for bullnose. For a more detailed look, watch this short video explanation. This is an example video of Schluter Quadec Profile edging. We build custom inset boxes. Whatever size you want, with as many shelves as you want. We make them so they conform to the layout of the shower and the material we are utilizing. Here's an example of a fully waterproof soap niche w/ a hard surface shelf. Schluter Systems all the way! A shower for the future and not one that is stuck in the past. Cement board? NEVER! This is an example of a soap niche edged with bullnose. Mitered edging on an inset box. This is an example of an inset box with solid surface shelves. The larger box and the shelves are an upgraded option delivered upon request. You have many options to edge a shower or inset box. You can edge with bull nose or a Schluter profile. This is an example of an inset box edged with a Quadec Profile and pre-made metal corners. Hard surface edging and shelves is a great option for your soap niche. If you want your inset box on your plumbing wall (like you see here) be sure to speak up during the planning stage, so we can reroute your plumbing! This is an example of an inset box edged with a flat stock Kerdi Profile with mitered corners. Another excellent option for your soap niche. Another option for your inset box trim is the mitered bull nose method...available upon request. Jason here working away. Notice the fine Tile House of Marietta shirt! Smooth Sailing all the way! Jason Hamilton, one of 1600 Certified Tile Installers in the United States. Putting together the shower at Jason's neighbors house. This one is ready for tile. Our projects turn out great, EVERYTIME, because we put careful thought into each job and we're experts in quality execution! The green caps are a leveling system called MLT. The cap holds a strap that is embedded in the thin set and they help to get a lip free tile installation. We mostly use these on rectified edge tiles. This stuff is pro grade, not to be found at the Home Depot. This one is coming together nicely. That floor feels great on my sock feet! With large format, rectified edge tile the MLT leveling system (or comparable system) is excellent to ensure a lip free floor or wall installation. For a large format plank tile using a leveling system is preferred. We've been using the Lev-tech system and it helps us get smooth, flat install. You can really see the difference in this photo. We are going for smooth to the touch...not just flashy to the eye. Here's something I know sets us apart. We GRIND our floors to get a clean, bare concrete foundation to set our tile. We know how important it is to have a clean surface and we always have grinding in our bids. We grind off previous finishes for the best bond. No farming out of hard labor! The guys you hire are the guys who show up to perform the install! Click here to read more about our efforts to stay compliant with OSHA's new silica rules. We waterproof a tub surround thoroughly. We want this space to last without the nasty mildew and black mold around the area between the tub and first row of tile.